« New head placement tools! As much fun as it is to work here at JibJab — see here and here and here — even we need a vacation. However, the JibJab elves, who have apparently not left the building for the season, like to punish those who dare to take some time off. 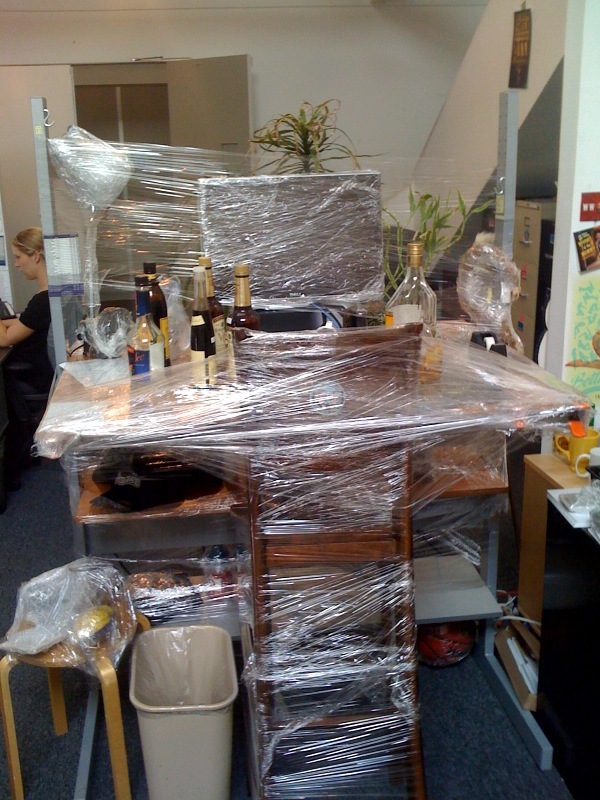 While Tim was away, all the JibJab Art, Tech and Business talent joined forces to implement the ole Wrap-The-Desk-In-Plastic-Wrap Trick on him. Please note the extra care they took to individually wrap any tool that could be used to help cut the plastic off; it’s been three days and Tim is still removing the plastic. This entry was written by paulhanges and posted on July 8, 2009 at 4:59 pm and filed under Inside JibJab, jibjab, Team JibJab, Uncategorized. Bookmark the permalink. Follow any comments here with the RSS feed for this post. Trackbacks are closed, but you can post a comment.